Astronaut Tom Jones: Our wide-angle 90mm lens on the Linhof camera captured the view below. The Linhof produced a 4x5-inch film negative, with incredible detail. Each magazine held 100 frames, and we refilled magazines with fresh film inside a light-tight bag, stowing the exposed film in canisters and manually spooling a new roll into the magazine. The film reloading was part of our nightly housekeeping routine. But it was hard to tear ourselves away from the windows! 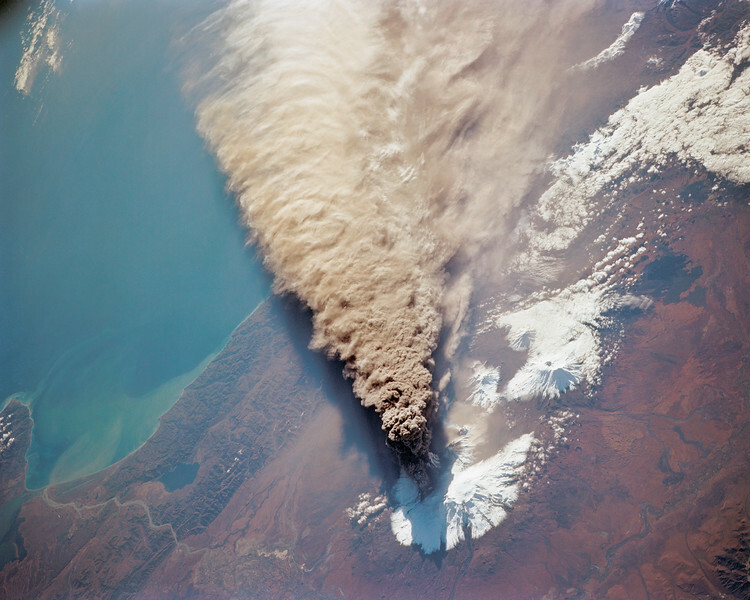 NASA: Kliuchevskoi Volcano's major eruption began September 30, 1994 (launch day) for STS-68. It got almost immediate coverage by the astronauts aboard the Space Shuttle Endeavour. The eruption cloud reached 60,000 feet above sea level, and the winds carried ash as far as 640 miles southeast from the volcano into the North Pacific air routes. This picture was made with a large format Linhof camera. While astronauts used handheld camera's to keep up with the Kamchatka event, instruments in the cargo bay of Endeavour recorded data to support the Space Radar Laboratory (SRL-2) mission. Credit NASA for all Earth images. Click here for usage policy.